How To Book Your Climb? Complete the Online Registration Form & Waiver sent to your email. THIS IS IMPORTANT. YOUR BOOKING IS NOT FULLY CONFIRMED IF YOU HAVEN’T SUBMITTED THIS. Your booking is now confirmed. Check out the initial instruction sent to your email. Please read our simple booking rules for our terms and conditions. You Can Also Schedule Your Preferred Dates By Booking our Package 2. However, our Package 2 can still be availed during months of April, May, June 2019. Click here for Package 2 info. What is our Secured Online Booking? Take the hassle out of queueing to the bank or typing your OTP to transfer money online. 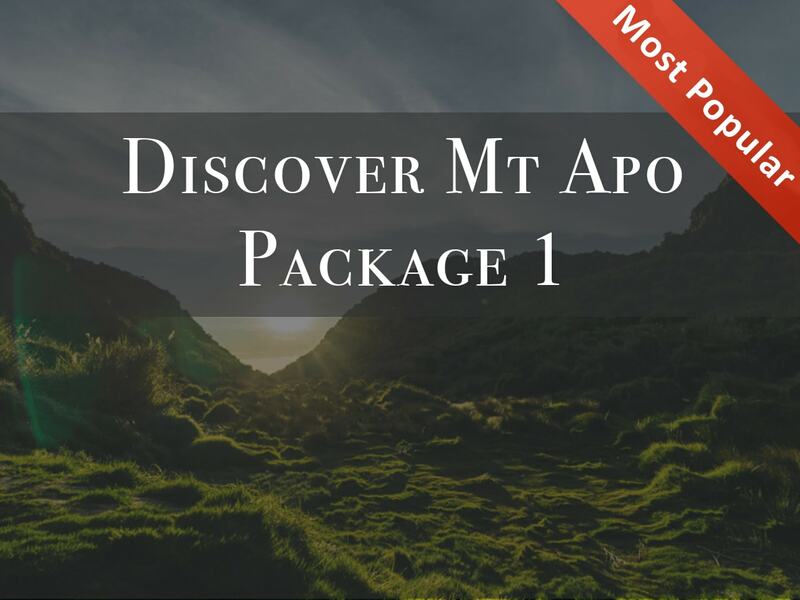 Book your Mt Apo climb here on our website. It’s secured and instant! What is our Bank Transfer Booking? 1) Send us your 50% deposit (our account will be provided once you ticked this option). 2) Send the receipt to our email: discovermtapo@gmail.com or FB messenger and your climb dates based on our schedule. Please also send your Names, and Email Addresses so we can forward the online registration forms. 3) Confirmation will be provided within 24 hrs once your booking deposit is confirmed. 4) Online Registration Forms will be sent to your email and instructions are provided. Please submit the forms immediately, It will only take 1 min. 1) Our group climb consists only of maximum 6 to 8 climbers. More than that is already a crowd. Your slot is only considered pre-registered once we received your full payment online or 50% deposit via our BDO Account. WE STOPPED CONSIDERING PRE-RESERVATIONS. No payment, no schedule. 2) Your slot is fully registered once you submitted the Registration forms. The forms should be submitted within 5 days after payment is confirmed. THIS IS IMPORTANT. 3) Non-refundable but transferable to other dates given we have a schedule on those dates. Please inform at least 30 days before your climb schedule. Climbing Mt Apo is not a right, it is a privilege shared to us by our mother nature so the local office limits the number of climbers to be allowed to climb per day. Beyond 30 days, the slot is already considered sold, meaning you need to pay for the full amount. 3.1. Acts of God: If your climb is cancelled because of Force Majeure, we will refund 50% of your total payment if this happened. Refund will take 45-60 days. 3.2. Cancellation by the Office: If your climb is cancelled by a government mandate due to unforeseen events, we will refund 80% of your total payment if this happened. Refund will take 45-60 days. 3.3. Cancellation of your flights: We are not liable to this type of event or similar. Your slot is still considered sold and you need to pay for the full amount. 3.4. Bookings that are purchased under “promo rates” are not eligible for a refund. 4) Once registered, your slot is non-transferrable to other climbers. Please be true to your words. 🙂 Tip: Book whenever you are ready, or if you have booked for a schedule, prepare and fulfil your commitment. Circumstances outside your booking (drawing, unpreparedness, laziness and the likes) are really not our problem. Please respect our time and money. 5) Your flight expenses are NOT INCLUDED in our packages, you are expected to secure it on your own. 6) The Itinerary is a guide and not absolute or will not be 100% perfectly followed due to many factors such as the weather condition, flat tires (yes this happened), climber’s endurance, traffic situation, climber’s preferences, etc. Some climbs may finish very early than the itinerary, while others finish a bit late. 7) We strongly discourage the use of your mobile phones as your headlight during a night trek, this is not safe for you and your group. Use proper headlights. You can also rent from us. 8) Group climb rates are considered for 3-4 climbers and more. If you prefer a private climb (1-2 climbers only), please book our Package 2. 9) All rates are subject to change without prior notice. 10) Please be aware that you may be climbing with a group that is vegan/non-vegan, vegetarian/non-vegetarian or a combination. 11) We do not include any insurance on your package, it is your full responsibility to secure your own insurance, if any. 12) Climbers who are 55 years old and above, please secure your medical permit that you are “fit-to-climb” or to do any physical activities. 13) Climbers who are 14 years old and below, a guardian is required or a porter is required. The registration form should also be with a parent’s consent. 14) This rule is subject to change with or without prior notice thus it is important that you keep yourself updated. By booking with us, you agree to follow our terms and conditions. Special discounts are also offered on group or company packages. Contact Us Now! Prices may vary without further notice.